Traveling to other countries and experiencing alternative cultures and lifestyles has become part of the norm for twenty-somethings and gap-year students. Everyone wants to pack up and travel to his or her own paradise for an unforgettable adventure. It’s become so popular in western society that people are now getting bored of it. So you’ve been to Asia? Who hasn’t? Did you find yourself drinking a bucket of cheap alcohol on a beach? Die-hard travellers are looking more for unconventional ways of living, and a unique way of doing this is spending time with a community that lives their life off-grid. North of the river in the beautiful country of the Gambia, Africa, an incredibly harmonious community is now opening their home to travellers who would like to indulge in a different artistic experience . 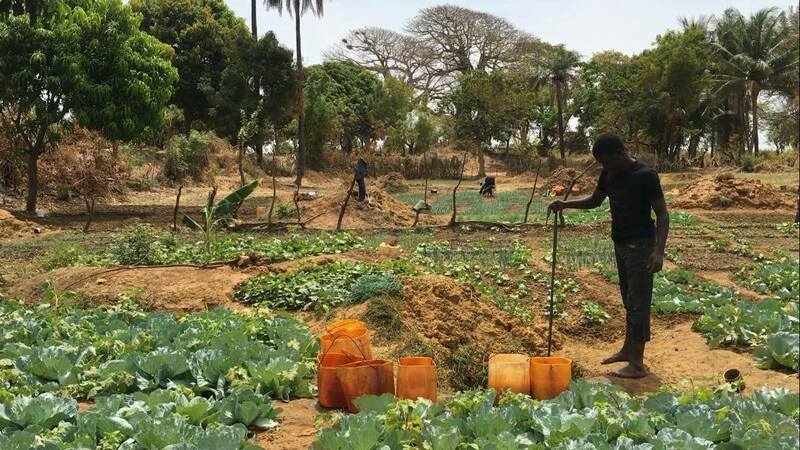 The place is called Kinkeling Community Garden and Arts Centre, which translated in the local Mandinka language means cooperate, a useful word for highlighting what this place has to offer. The gardens offer a modest three acre, used communally by several of the local families for growing vegetables and fruit trees. Although a project that has been around for a while, they have now opened the experience up to travellers. You are able to spend the days helping the local women in the gardens, going back to old-school methods of gathering water with a well or just relaxing in the idyllic surroundings. But there is a deeper message behind the oasis façade. Allen Kerr, an incredibly sweet and humble man from Devon has seen potential, and set up an inspiring project here. “More and more people are looking to off-grid living for their holidays, so this project is about giving back to a small community,” he said. Allen has been travelling to the Gambia since 1996, and has known the people of the Kinkeling gardens for nearly twenty years. This time has allowed him to build a strong relationship with the community, and create strong links with local musicians and crafts people. The moving bond they have built shows real love, determination and a compassion for the community. It isn’t a secret that the United Kingdom has its own stresses, anxieties and worries, but the Gambia is a country of real poverty. These people, although sometimes struggling to feed their children and access purified and clean water, have such a positive and blissful outlook on life. The project has a deeper message than just giving back to a small community. Their aim is to create a sustainable, organic garden and arts centere to not only support the lives of the people within this community, but work towards having a profound impact on environmental and social issues including well being and health, deforestation, cross-cultural dialogue and addressing the major imbalance of wealth. That’s where the beauty of music and dance comes in. Being a musician himself, Allen has set up daily guitar lessons in one of the small houses that they’ve been able to build to accommodate guests. Experiencing these guitar lessons, involving one of the local African men and two visitors showcased the magic music has of connecting people around you regardless of your language – all with no Wi-Fi or phone in sight. 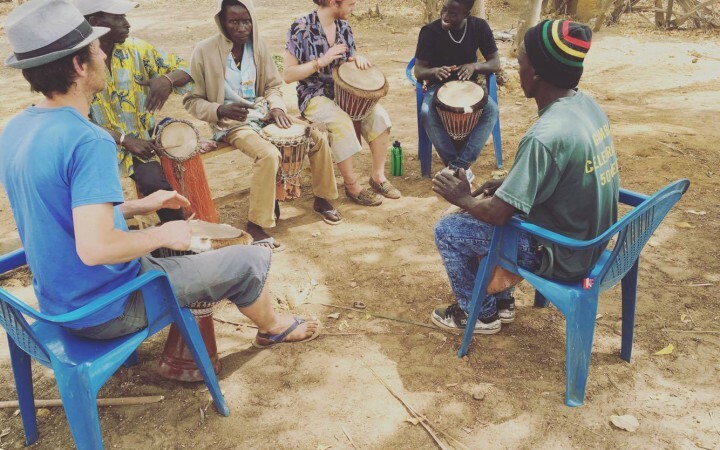 The locals, with the help of Allen, give guests drum lessons just out of the gardens where you can learn the rhythms and beats in an environment free from jest or judgment. Caroline, one of the guests from Brighton staying with her good friend had been there for two weeks and were the community’s first paying guests. “It’s wonderful,” she said. “I’ve really enjoyed myself here and it’s such a shame I have to go back tomorrow. I’ve spent my days helping out in the garden, and then in the evening we have a dance lesson. “They tell me I’m good but I think I’m just making a fool of myself. The surroundings are a wonderful way to enjoy music, drumming, dancing, meeting new people and learning the joys of a culture that have more wealth than money can offer. At the moment, Allen has used crowdfunding back Britain to build a simple house on-site for one member of the community. They are still looking for donations and are hoping that people will come and support their project for a rewarding experience. Allen’s next big mission is to dig a borehole and provide clean drinking water, and to build some more guest accommodation for visitors to sleep in. A few visitors a year will allow this dream to become a reality. Check out the video below for a taster of what happens at the Kinkeling garden community and arts centre.